1. Choose the right plant for the right place! 2. Consider the size of the plant at maturity. Properly caring for a plant will greatly influence it's rate of growth. While it often tempting to select plants that will provide a quick fix, remember that the fastest grower may not always be the best plant for the spot in the long run. In fact, many fast growing plants may have undesirable characteristics that must also be considered. "Slow" growers, given proper care, may be more satisfying in the end. Make sure your plant and your planting site are a good match. Choose plants that will tolerate the site's environmental factors. For example, plantings in areas affected by winter de-icing salts should be avoided or planted with species that are tolerant of salt. Similarly, moisture tolerant species are you best choices for sites with poor drainage and heavy soils. Hardiness refers to the ability of a plant to survive the temperature extremes in a particular region. Plants are tested for hardiness and given a rating that indicates the zone in which they can be expected to survive and thrive. To help insure the survival of your plant, pick one that is hardy for the area in which you will be planting. The health of your plant and soil, the location of your planting site, and the care you provide, all have an important impact on determining the hardiness of your plant. Plants require both oxygen and moisture for proper growth. Carefully examine the soil and drainage of your site before planting. To test drainage, dig a hole 12 inches deep and fill it with water. The water should drain away at a rate of approximately 1/2" per hour so that the hole is empty after 24 hours has passed. If the water still remains in the hole after this time, a drainage problem exists. Don't conduct this test after periods of heavy rain. Contact your local nursery professional for advice on soil texture and soil structure. Professional advice is best when considering soil amendments. Normal pH of 5.5 to 7.5 is best for most plants. Low pH indicates a soil that is acid. Some plants, such as blueberries and rhododendrons, require low pH (4.5 to 5.5 to do well. A pH greater than 7.0 indicates alkaline soils which normally exist next to the foundation of a home. Soil pH can be altered through the use of many different materials. A soil test may be advisable. Contact your nursery professional or county extension office for information on soil testing labs. Consider the surroundings and any obstructions plants may encounter as they grow to maturity. Nearby structures and plants will affect levels of light, temperature, moisture and hardiness. Plants can be used for shade or as a screen between you and your neighbor. Plants can bring flowers and fruit, or autumn color, to our homes. 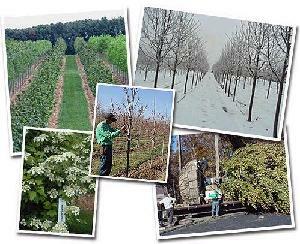 Plants can provide structure and color to winter landscapes or food and shelter for wildlife. Containerized plants are the most widely sold plant material in nurseries and garden centers today. Before the plant is offered for sale, the roots should be firmly established in the container. When planting containerized plants, always remove the container at the planting site and disturb the root ball as little as possible. Container grown plants suffer very little transplant shock and can be successfully planted though out the growing season. However, when you remove the container at the planting site, you may find the root ball to be very tight or even root bound. The tighter the root ball, the more it should be disturbed before planting. Any roots circling the trunk or following the contour of the container should be cut to alleviate possible growth problems later. Never completely break up the root ball for either containerized or container grown plants. B&B plants are dug when dormant and are then held for planting throughout the season. It is usually the most expensive form in which plants are offered but it is very reliable when handled properly. B&B plants may be difficult to transport and plant without special equipment due to the weight of the plant and root ball. Consider having B&B materials delivered and/or planted at your site by your nursery or landscape professional to avoid damage to the plant. Roots of the B&B stock will be seriously damaged if the soil ball is broken or damaged in any way or is allowed to dry out, so proper care and handling is extremely important. The soil ball around the roots of a B&B plant is normally held in place by burlap and twine or a wire basket. When planting, a wire basket may be left in place. However, if twine and burlap was used, you must cut and remove all twine from the trunk of the plant and pull burlap away from the trunk and the top of the ball. When planting is complete, the burlap must be tucked well below the soil surface. If exposed, it will act as a wick and pull moisture away from the root ball and dry it out. Always make sure that the root ball on B&B stock has not been loosened or damaged in any way. Field potted refers to plants that are grown in the field, then dug and placed in a container with the field soil intact around the root ball. It is very important that the root ball be disturbed as little as possible through out the handling of field potted plants. Since field soil does not make a good growing medium in a container, plants should not be held in field pots for long periods of time. When planting field-potted plants, always remove the container at the planting site before planting. While some containers may be biodegradable, this usually occurs too slowly and will interfere with proper growth of the plant if not removed. Bare Root plants are normally dug in fall or spring. The soil is removed from the roots of the plants and the plants are then held in controlled settings with cool temperatures and high humidity. While bare root is normally the least expensive, it will suffer most severely from transplant shock and has the highest mortality rat if handled improperly. It is extremely important that roots be kept moist and protected from sun and wind at all times during handling, transportation and planting. Bare root plants must be planted in early spring before the plant breaks form dormancy and growth begins. At the time of planting, prune away any roots or branches that appear to be diseased or damaged, but do not cut back healthy branches severely. As the buds on those branches begin in breaks, they will signal the roots of the plants to begin to grow. Packaged plants are simply bare root plants whose roots have been packed with a material such as peat moss. These should be handled in the same manner as bare root plants. It is very important that the packing material be kept moist and protected at all times. A tree spade is usually used for transplanting larger trees and greatly increases their rate of survival. When having a tree-spade tree planted, the matching planting hole must be pre-dug by the machine. The tree and it's surrounding soil is then dug by the same machine which also transports it to the planting site and deposits it in the hole.